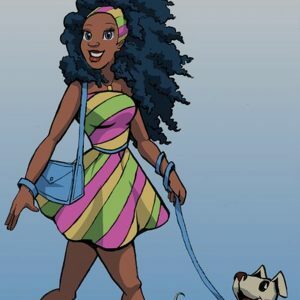 Here are a few of the colouring books that I have come across recently that celebrate diversity and feature black characters. Colouring books can be cheap and cheerful. However if you want colouring pages with black kids or natural hair then you may have to pay a bit more. The books I have chosen here are high quality products created by named authors and illustrators. Some have special features like activity and journalling pages. All are designed to be empowering. This 64 page book is full of boys getting into things like footballs, fireflies and fishing. Cute and cheerful drawings of little dudes will encourage small guys to get the crayons out. Chiquanda also has a sweet book for girls. It was hard to pick a favourite from this author’s appealing selection of books but I went for the STEM book as it features a multicultural cast of cute girls who cry out to be coloured in. There are also questions for the child to answer so a very endearing souvenir can be created. JD Wright has free pages to download on her site showing black kids with cool hairstyles. My absolute favourite page in the set of images of girls with big dreams shows a woman strolling barefoot along a beach She asserts that she wants to be a mom and will foster, adopt or have her own kids. 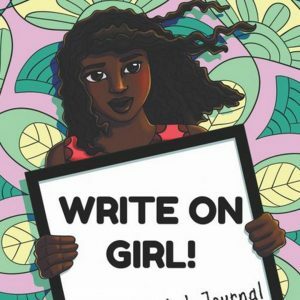 The drawings of multicultural young women doing valuable work make this a fabulous career guidance book. Is she can do it so can I! I’ve blogged about this book before because I just love colouring it in. Cheerful , gorgeous women with natural hair are shown in a range of activities. The drawings by Janine Harrington are printed on one side of the paper only and cry out to be framed. Crystal Swain Bates has many great books. I was complaining about the shortage of books for boys and author Crystal Swain Bates drew my attention to this fun filled 40 pager. 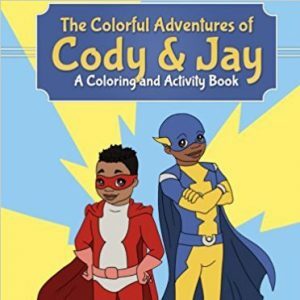 Cody and Jay are two lads who love to have fun. The book has activity pages, drawings to complete and a positive celebratory attitude. Spaceships and cars feature. As I mentioned earlier I was complaining about books for boys in Instagram and Plum Street Press drew my attention to Swift Walker – a chirpy little characters who stars in many books for the 4-8 age group. Swifts loves travel and adventure. The drawings of Swift with his natural fro and just doing a little bit of work for representation. I have been watching this one on instagram for a while as the author jilleybeanbooks showed off pages and details of the project. I don’t have a copy yet but I can see from the reviews that as well as having drawings that girls will adore, the book deals with all the topics facing girls. What really caught my eye was the pretty pre-teen saying a prayer and having a chat with God. I was impressed as a lot of books talk about empowerment without acknowledging spirituality. 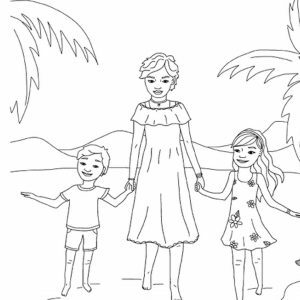 The characters from my book A Fairy in the Family Again have their own colouring book. The book was developed in London. It shows Jada-Kai, Keysha and Ruby as totally cool baby-sitters. The idea is that the child colouring the book is learning from these kind-hearted big girls about what big kids love to do. Those things include science, baby-sitting and black hair. 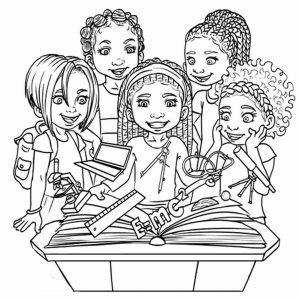 Girls will get to colour in pages with science, geckos, hairstyles, braids, unicorns, natural hair and even an African Princess Fancy Dress Party. Next PostNext Colour in the African princesses.